•For packing and sealing of drying goods. With the valuable assistance of skilled team of professionals, we are engaged in offering an extensive range of high-quality Sealer. We are instrumental in manufacturing and supplying an extensive array of Horizontal Band Sealer Machine. Offered array of machine is fabricated from superior quality components and advanced machinery in accordance with the international quality standards. High quality sealing strip to maintain sealing strength at high temperature. Brass rollers used to transfer heat to strip. Special MS rollers to provide knurling effect. Due to our honest business standards and transparent deals, we are steadily making our way to the platform of success by offering Horizontal Band Sealer. 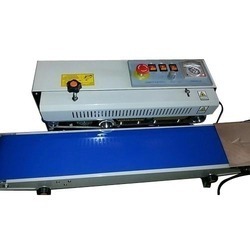 At Harshidhi Industries, we manufacture and supply top quality horizontal band sealer machines (Model: HSI– 105), manufactured of superior quality raw materials and components.